airBaltic’s restructuring plan fittingly dubbed 'ReShape' is in full swing now, but the loss-making Latvian national carrier is facing increasing competition from its northern counterpart Estonian Air, which is copying airBaltic’s model. The tactic is not surprising as Estonian Air’s president and CEO Tero Taskila was airBaltic’s former CCO and helped implement the carrier’s shift from point-to-point operator to a network airline based around feeding transfer traffic between Western Europe and markets in Eastern Europe, the Nordic region, Russia, the Commonwealth of Independent States (CIS) and the Middle East. Ironically, airBaltic is currently moving away from a stringent focus on transfer traffic over its “North Hub Riga” at Riga International Airport to a more point-to-point approach as part of its drive to return to profitability and build a sustainable long-term business. Too much transfer traffic and a testing public dispute between the airline’s two main shareholders, which resulted in a decline in customer loyalty, brought airBaltic uncomfortably close to bankruptcy last year. airBaltic’s traffic at present consists of 50% transfer and 50% point-to-point. The carrier is now seeking to change this equation over the next five years by reversing the priorities, and mainly expanding point-to-point. “Transfer traffic caused the losses. I’m happy there still is an airline,” CEO Martin Gauss tells CAPA. Financial results for 2011 are not yet released but it is expected that the carrier will report a deficit of around LVL80 million (EUR115 million) following on a consolidated loss of LVL36 million (EUR52 million) in 2010. Revenue is anticipated to be flat on 2010. Revenue in 2010 amounted to LVL204 million (EUR292 million), which was a 12% increase on 2009. airBaltic reported a 2009 profit of LVL14 million (EUR20 million). Mr Flick participated in the capital of airBaltic through Baltic Aviation Systems (BAS) and the Latvian Government stepped in to acquire BAS’ 47.2% stake in the carrier. This brought the Government’s total ownership of airBaltic to 99.8% and effectively re-nationalised the airline. airBaltic has achieved a very high passenger growth since 2003, when it started developing a hub-and-spoke model around its so called North Hub Riga to compensate for its limited O&D traffic. “It’s easy to achieve passenger growth, I can easily grow to 4 million passengers but the focus from now on is EBIT. We have to create shareholder value,” Mr Gauss said. ReShape is aimed at returning airBaltic to profitability by 2014. The target is to trim losses to LVL38 million (EUR54 million) this year, a further reduction of the red ink to LVL16 million (EUR23 million) in 2013 and turning a profit of LVL10 million (EUR14 million) in 2014. The restructuring plan targets to improve the carrier’s performance with LVL330 million (EUR473 million) between 2012-2016 and works on three pillars: cost reduction; revenue enhancement; and fleet modernisation and network improvements. airBaltic’s fleet plan includes fleet modernisation and simplification from five aircraft types to only two – Bombardier Q400 turboprops for regional operations and either A319/A320 or Boeing 737NG narrowbody jets for its main routes. The carrier currently has a fleet of 34 aircraft consisting of 14 older-generation 737-300s/-500s, two 757-200s, eight Q400s and 10 Fokker 50s. The carrier introduced new Q400NextGen turboprops at the end of 2010 and all eight of the type are being leased from Nordic Aviation Capital (NAC). The carrier recently has mandated Skytech to help it acquire three used Q400s, which could be deployed as from this autumn, Mr Gauss told CAPA. It also has options on an additional five Q400NextGens. Gradually all aircraft except for the Q400s will be phased out over the next six years as airBaltic modernises its fleet. The 757s have left the carrier’s operations and are leased out on a long-term lease contract to a leisure airline in Cambodia. The leases on the F50s will expire by early 2014, however, airBaltic will ground all these aircraft with the start of the IATA northern winter schedule at the end of Oct-2012. airBaltic hopes to make a decision in Jun-2012 on the new narrowbody order. The order has been in the pipeline for a couple of years, with the carrier’s former management touting it was evaluating an order for up to 30 new narrowbodies in Apr-2010 with the first new 737 or A320 family aircraft potentially joining the fleet by the end of that year. The order for the new narrowbody jets that is currently being discussed is smaller in size and will be for up to 20 aircraft, Mr Gauss said. The order could consist of 10 firm aircraft and 10 options or rolling purchase rights. “We are pretty clear on what we want [Boeing or Airbus] and the next step is approval from the supervisory board. They then will take the proposal to the shareholder,” Mr Gauss said. Latvia’s Government injected fresh capital at the end of 2011 after it resumed control of airBaltic, putting the airline on firm financial footing. But the new narrowbody order will require additional funding. In the winter 2012/13 schedule, airBaltic will operate 22 aircraft compared to 34 one year earlier. In terms of ASKs, the reduction is not as pronounced because the Q400s have a larger seat capacity than the Fokker 50s. airBaltic’s Q400 NextGens are configured with 76 seats while its Fokker 50s have 46, 50 or 52 seats. airBaltic applies a hybrid airline model with features from traditional full service and low-cost carriers. The carrier operates to primary city airports rather than secondary airports, has a frequent flyer programme and offers a business class product. But for economy class it is very close to a pure LCC approach with no frills and a number of ancillary charges such as seat selection, priority check-in and checked baggage. Business class (airBaltic blocks the middle seat for sale like most European network carriers) is available on all routes but it achieves good load factors only on a couple of routes, such as Riga to Moscow. airBaltic flies to both Moscow Domodedovo and Moscow Sheremetyevo airports. The airline is looking at several options for its business class, and might eliminate business class on routes with no demand for the product. Mr Gauss believes LCCs will further expand on intra-European routes and airBaltic has to adapt to this environment and lower CASK further, he says. LCCs (including airBaltic) have a dominant position at Riga International Airport and account for 88% of the total seat capacity at the airport. The largest full service carrier at the airport is Aeroflot, which offers about 4800 weekly seats, equating to a capacity share of less than 2%. airBaltic is by far the largest carrier at Riga, accounting for about 63% of ASKs, 68% of seats and 74% of frequencies to/from the airport. airBaltic’s network covers 60 destinations in Europe, Russia, the CIS and the Middle East, and all are all routed via its Riga base. The carrier will maintain a hub-and-spoke operation but the weight of transfer traffic will gradually decline as the carrier views to increase frequencies only on routes with a high point-to-point demand. 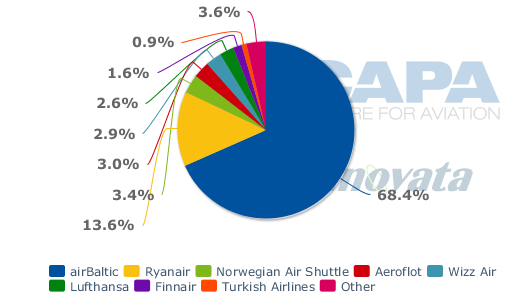 At present, 20 of the carrier's routes contribute 80% of revenue and 10 routes contribute 60% of revenue, which Mr Gauss says “shows we have some very good routes.” Nine of its 10 largest routes in seat capacity are in Eastern Europe and the Nordic region. As part of the streamlining of its network, the carrier stopped operating secondary hubs in Vilnius, Lithuania and Tallinn, Estonia. airBaltic also gave up on the ambition to set up a hub operation in Oulu in Northern Finland. The carrier was one of the candidates to buy Finnish Commuter Airlines (FCA) in 2010, but the privately held Finnish regional carrier was jointly acquired by Flybe and Finnair in Jul-2011 and now operates as Flybe Nordic. Flybe Nordic earlier this month inked a MOU with Finnair to take over 12 Embraer aircraft and one third of its short-haul operations as part of Finnair’s drive to bring its Europeans operations to profit. Ultimately the airline will go back to private investors, or at least this is the target. Prudentia, the Baltic region’s largest M&A firm has been mandated by the Latvian Government to find private shareholders. As is the case with so many loss-making small and medium-sized airlines in Europe, a lot of names of potential investors do circulate, including Turkish Airlines. Representatives from airBaltic joined the Latvian PM Valdis Dombrovskis on his Mar-2012 state visits to the United Arab Emirates and Qatar, where the airline was presented to Etihad Airways, Emirates and Qatar Airways as an “investment project”, according to the The Baltic Course citing the PM. The outlook in Europe is very challenging, owing the well publicised euro-zone worries, austerity measures and economic contraction in several countries. The economy in Latvia is picking up and GDP is forecast to growth with 3%, but the small Baltic state received a EUR7.5 billion bailout from the International Monetary Fund and the European Union in 2008 and this comes with strict budget targets and belt tightening for the population. airBaltic outlined a restructuring programme to bring it back in shape, but competition is merciless and its northern neighbor Estonian Air is benefitting from the “success story” image that airBaltic enjoyed some years ago. The Tallinn-based airline announces new passenger records each month. Passengers will more likely book with the success story rather than an airline in restructuring mode, which always comes with employee unrest. airBaltic is a flexible airline. It was quick to recognise the unstoppable rise of the LCCs and position itself as one of them (the carrier generates one of the highest ancillary revenues per passenger in Europe) and it managed to maintain a dominant position in its home market. With the devastating shareholder dispute settled, airBaltic can now focus on its ReShape turnaround plan to secure its future.